By DAVID LEAMAN | Tasmania has an enormous share of a rock produced in the Jurassic Period and this rock has both put Tasmania on the map and shaped its economy and future. Along the way it was the genesis of many of the place names you now see on that map. 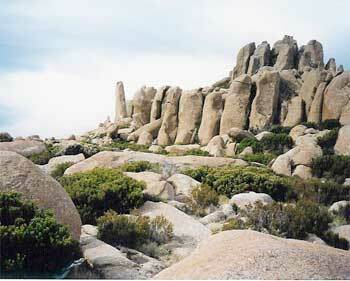 The rock is dolerite, of which Tasmania has more, accessibly exposed, than anywhere else in the world. The early explorers were both baffled and struck by its beauty and presence. Starting with Captain Abel Janszoon Tasman, on November 26, 1642 when two small vessels splashed into the southerly swells, their captains and crews anxious to avoid the jagged rocks of the coast to leeward. Everyone had been on edge for two days, ever since land had been first sighted and the compass had swung erratically. This was not a good omen. This was a great adventure ordered by governor Anthony Van Diemen to find a piece of the Great South Land and determine whether trade was possible. He had been pestered by Jacobsen Visscher to undertake such an expedition and Visscher was present as second in command. Visscher was fascinated by the compass problems and later wrote a scientific paper on the issue. A small island south east of Marion Bay, composed entirely of dolerite, is named for him. They had rounded the great bastion of what we now call South West Cape and had passed Maatsukyer Island. Before them rose up a great line of cliffs, Fluted Cliffs. We know this point as South Cape. 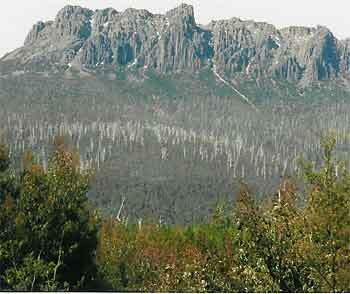 Dolerite had just entered the story of modern Tasmania. 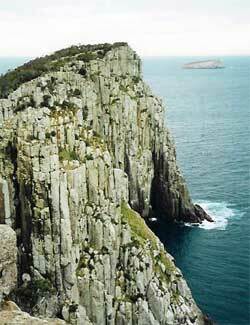 Until Tasman and his ships left Tasmanian waters on December 4, 1642, he saw little other than this rock and its spectacular, and frightening, coastal scenery. Great cliffs framed a large bay he called the Bay of Storms and more fluted cliffs rose beside a large sandy bay which others have named Adventure Bay. None of the intrepid Dutchmen had seen a coast like this before and the reason is quite simple there are no others like it in the world. The highest cliffs of all were seen to the east and some of these presented jagged spires and columns to the sky. We have no record of what Tasman thought the rock was but sketches were made, and he was impressed. None of the intrepid Dutchmen had seen a coast like this before and the reason is quite simple there are no others like it in the world.